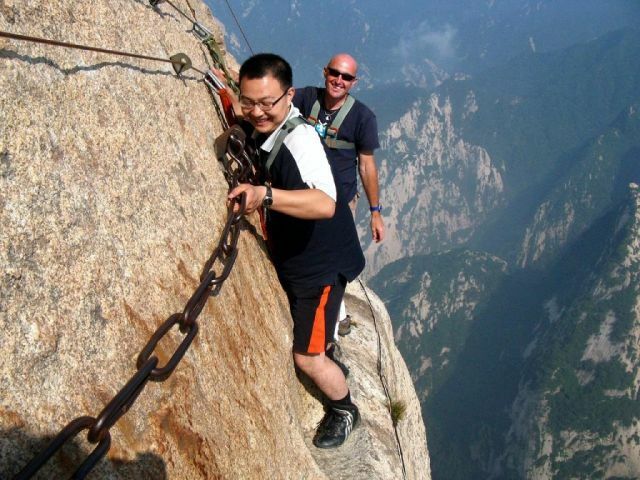 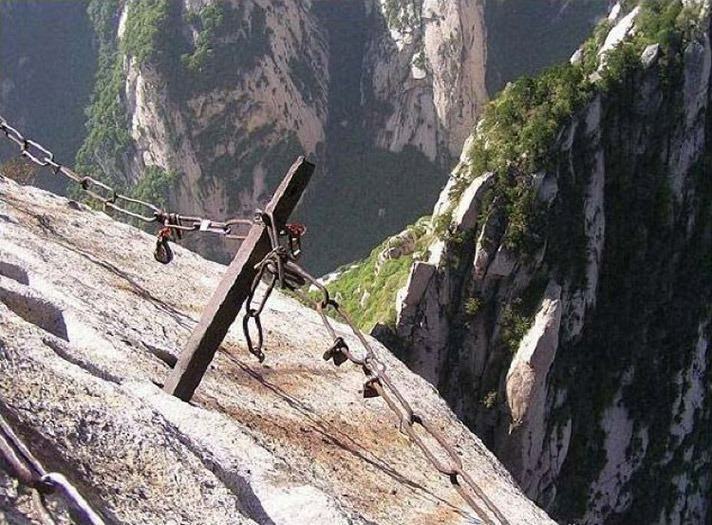 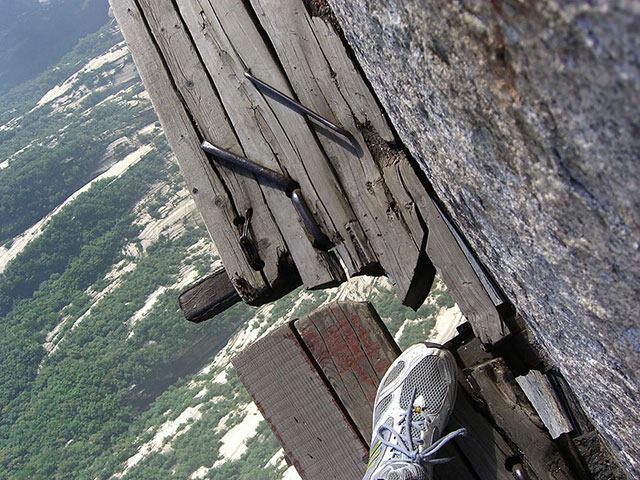 Deep in the heart of China lies Mount Hua Shan, one of China’s five most sacred mountains. 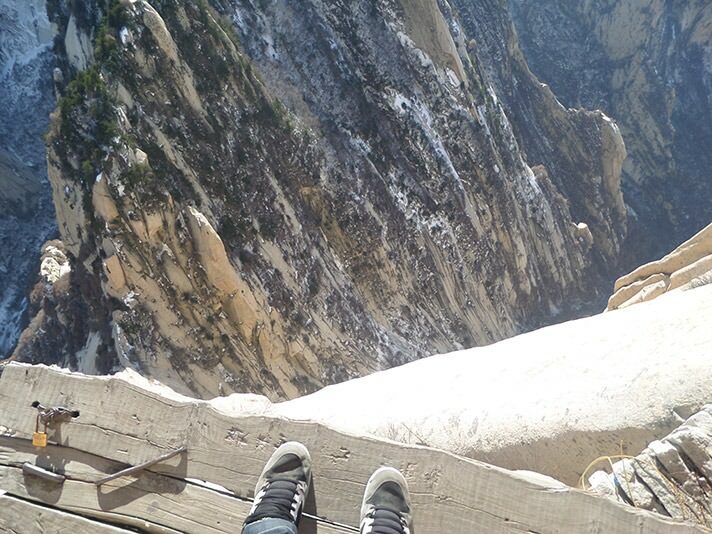 At a height of 7,070 feet and a sheer cliff face, it is a sight to behold. 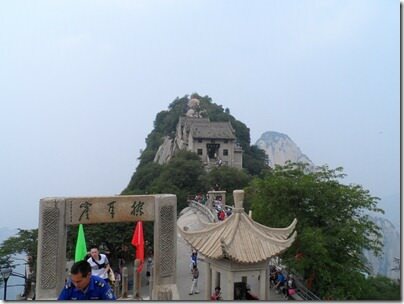 The mountain is very important in the Chinese Daoist faith. 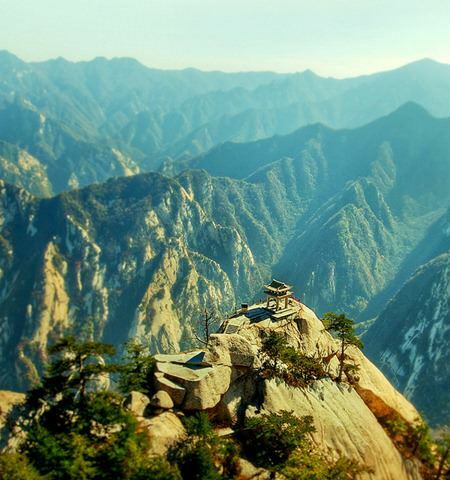 The Daoists believe that Mt. 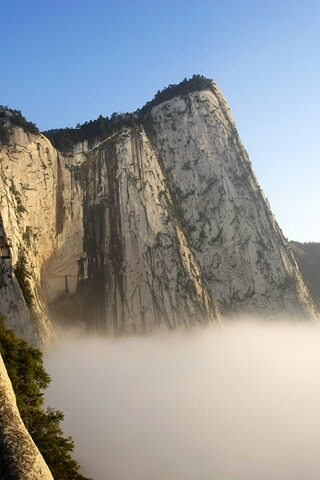 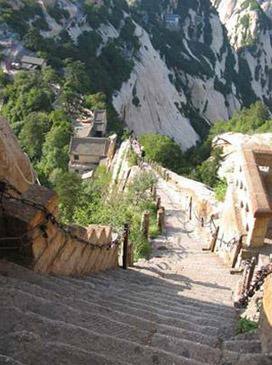 Hua Shan is the home of the God of the Underworld, Yama. 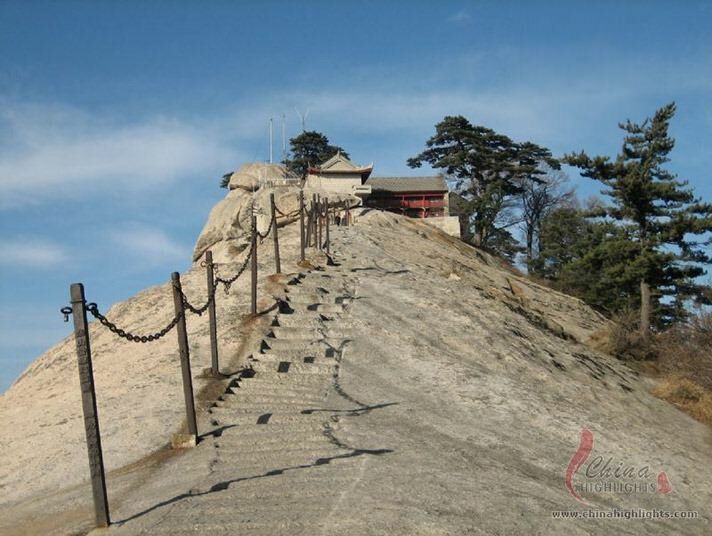 The mountain housed a temple to Yama as early as 2nd century BCE, called the ‘Shrine of the Western Peak’. 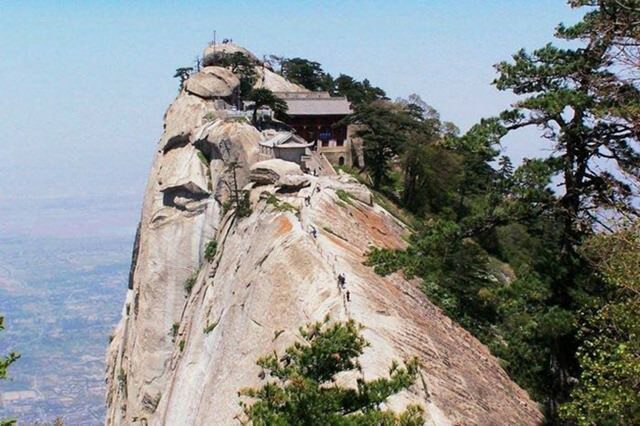 For centuries, this was an important pilgrimage point for Chinese Emperors. 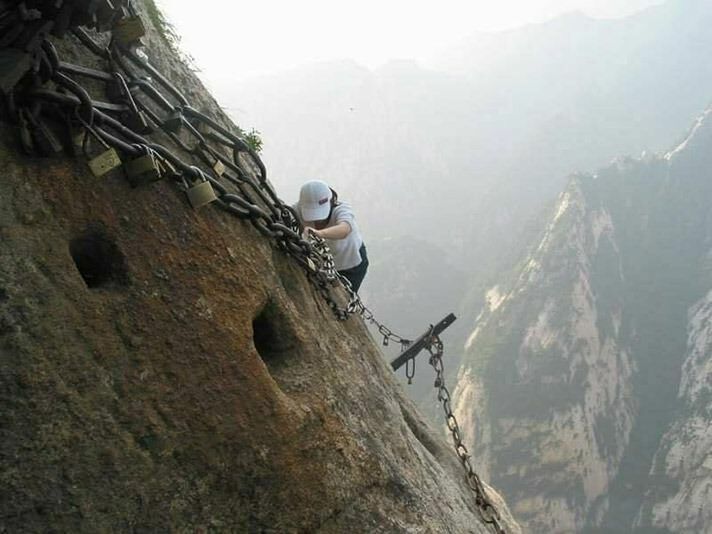 Getting to the top of the mountain, however, is no easy task. 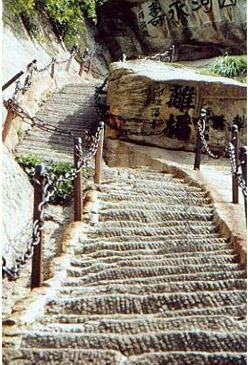 And lead directly to an ancient town. For centuries, this town has served as a resting point for weary travelers. 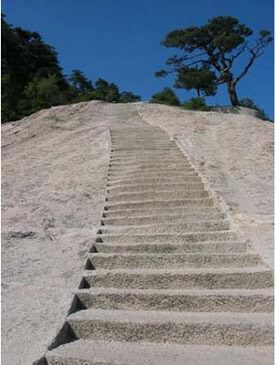 Here, you can catch your breath, drink some water, and take a big gulp of courage because the real challenge has just started. 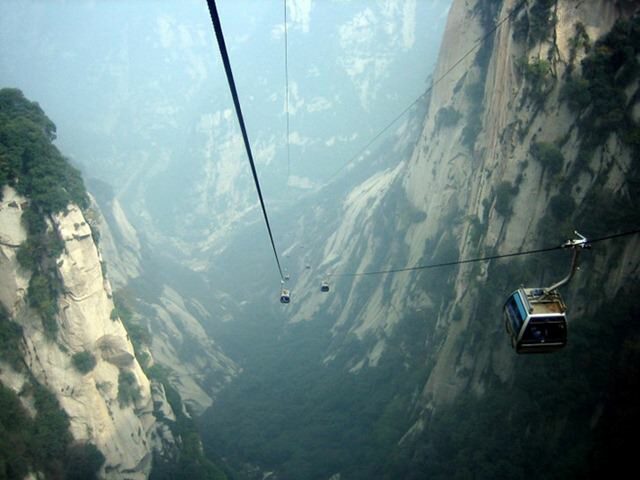 Yes, that’s a cable car. To get to the South Peak, you’ll have to climb aboard one of these rickety ‘gondolas’. The view is breathtaking, and equally terrifying. 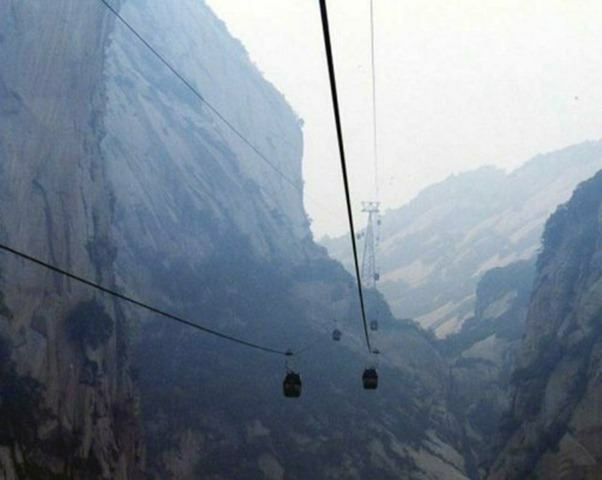 Once the gondola drops you off at the base of the South Peak, you’ll have to climb a narrow path. 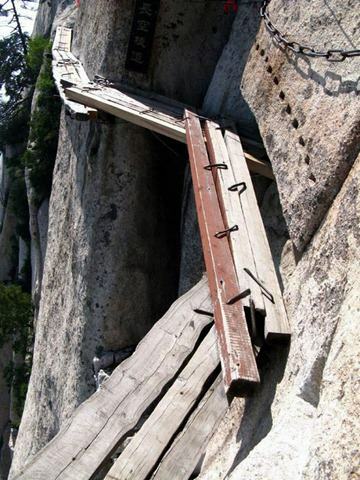 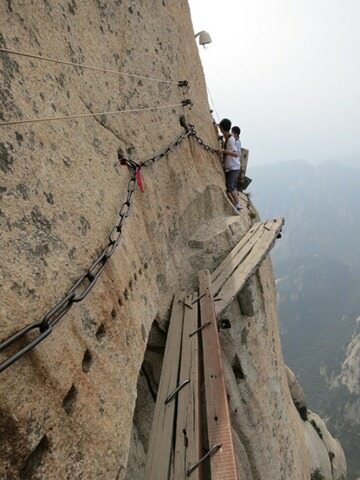 Eventually, the path gives way to wood planks nailed to the side of the mountain. 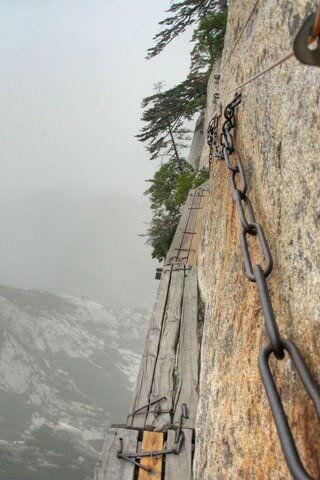 That’s a sheer drop of a few hundred feet with absolutely nothing to break your fall. 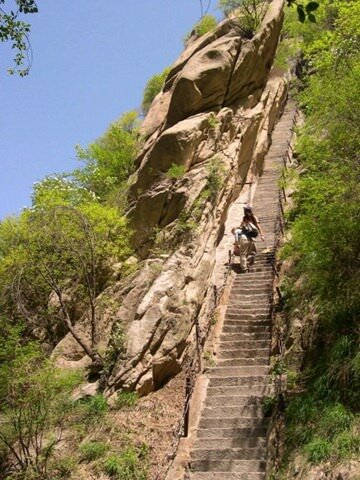 You’ll arrive at the top! 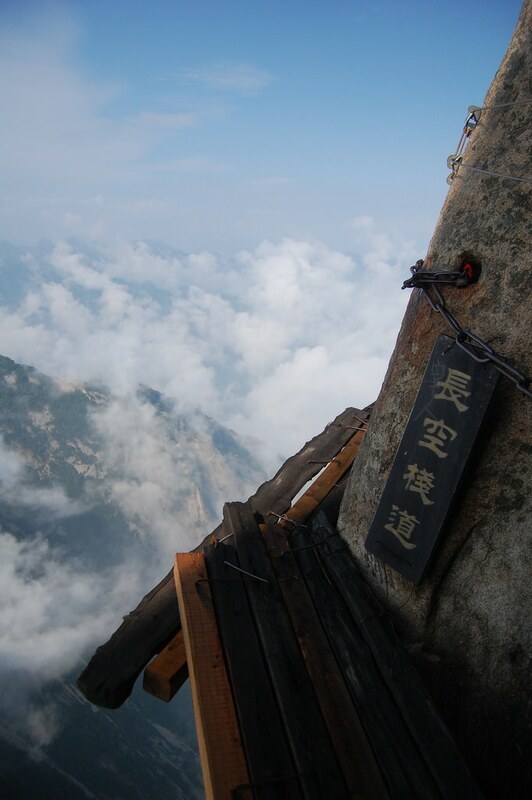 And what awaits you at the top is…a teahouse! Yup, you just risked limb and life to drink some tea on top of a mountain. 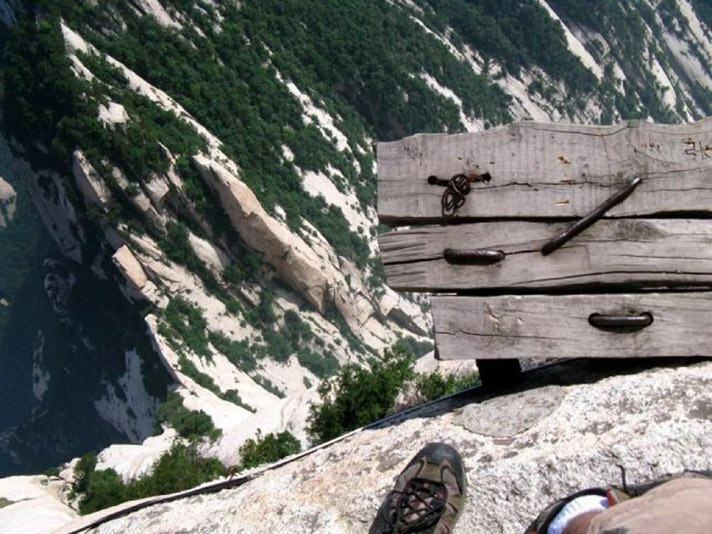 For your efforts, you do get a shrine with with spectacular views. 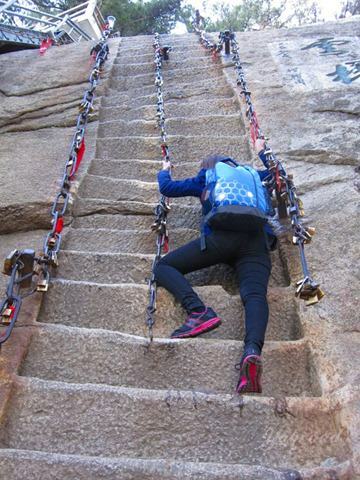 And the satisfaction that you are among the elite few who climbed the most terrifying trail in the world. How many of your friends would have the guts to make this climb? 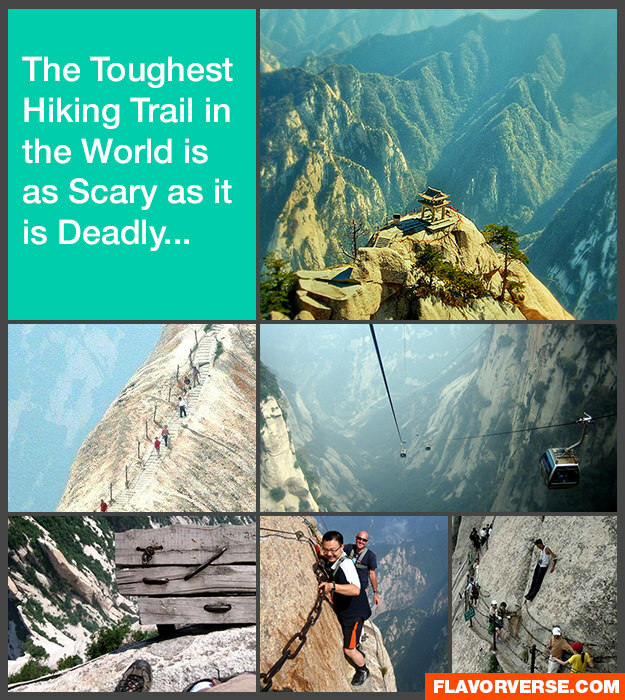 Share this post with them and let them know!